With power outputs of 500bhp at the wheels now being possible on the 2.5-litre, 300PS turbocharged inline 5-cylinder engine found in the Mk2 Ford Focus RS (and also the Focus / Mondeo ST,) its no surprise that this engine is regarded as a tuners favourite. And now Belgian performance valvetrain specialist Cat Cams NV has developed the ultimate cams for the Blue Ovals flagship models a pair of performance Sport profiles that maximise the mid-range and top end power and torque output on tuned examples of the Focus RS and Focus / Mondeo ST, whilst retaining everyday driveability. Careful design by Cat Cams means that these are the most aggressive profiles that can be used on the standard pistons. Mindful that most Mk2 Ford Focus RS / ST and Mondeo ST customers retain the standard ECU, Cat Cams has optimised the timing to maintain the factory idle and emissions characteristics. This also ensures low-speed driveability and MOT compliance, whilst promoting rapid turbo spool up even on cars running larger, aftermarket turbochargers. Back to back dyno testing by leading Ford tuner Devil Developments on a Stage 3 modified Focus RS (running standard injectors and turbo,) has shown that impressive gains of up to 40bhp and 36lb.ft are possible with the Cat Cams Sport profiles, with power and torque increases from 3000rpm to the 6500rpm limiter. Testing on a Stage 4 tuned Focus RS (with larger injectors and uprated fuel pump, plus further ECU remapping) has shown similar gains, peaking at 417bhp and 456lb.ft of torque. CNC machined from top quality steel billets, the Cat Cams Sport 2395302 profiles are a direct swap for the original Ford cams and are directly compatible with the OEM mechanical followers, avoiding the need for valve clearance reshimming. 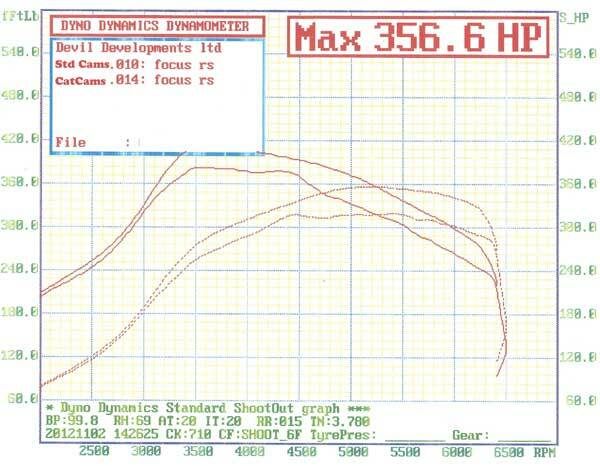 When fitted with larger injectors, fuel pump and stage 4 remap the car make 431bhp & 468lbft torque! !